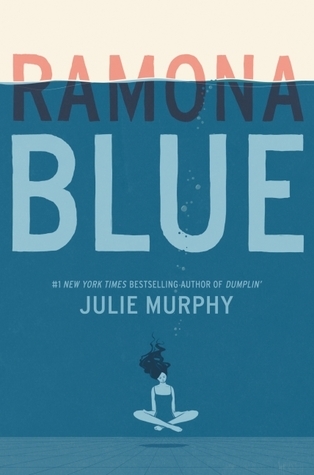 I was really looking forward to reading Ramona Blue by Julie Murphy, as I had read her two previous books, Side Effects May Vary and Dumplin', and really enjoyed them both. I knew I would end up loving Ramona Blue as well, and I totally did. This book is full of wonderful characters. The main character, Ramona, is pretty great. She's definitely not had the easiest childhoods, and has lost more than any person should have to, but she makes the most of what little she has. I love how fiercely she loves her family, and is willing to do just about anything for them, including give up her own future to help her sister. Her mom is a flake, but she has a really great dad, who is loving and supportive and works hard to take care of his family. Ramona also has some pretty great friends as well, including Freddie, who reappears back in her life after years of being away. The storyline for this book has so much to it. Not only is it about life and family, it's also about losing everything you have, and managing to survive. Hurricane Katrina took everything from Ramona and her family, and while life is far from perfect for them, they are getting by together. Of course she wants more from her life, but she will always put her family first. The story is also about discovering things about yourself, even when you thought you already knew exactly who you were. Ramona likes girls, but when her girlfriend breaks her heart, it's Freddie, also fresh from a breakup, who helps her through it. Ramona doesn't know what to think when she starts having feelings for Freddie. She knows that she still likes girls, but could she like Freddie as well? Ramona also discovers a love for swimming along the way, and how it could possibly be a start to a new future for her, a future she never thought that she'd have. As I said, there is SO much in this book, and I don't feel like I'm doing the book justice at all. Check it out and see for yourself! Overall; Ramona Blue was a really great read, and I'm so glad that I had it on my TBR this month! Julie Murphy's books just get better and better, and she's definitely on my list of authors to keep my eye on. I'm super excited to check out ALL the new books that she has coming out in the future, (and if you haven't checked, there are a LOT of them!). Dumplin is still my fave Murphy book, but I really enjoyed this one as well, for many of the reasons you mentioned. This book carries a very hopeful message about being after to redefine yourself and your circumstances. That you are not put in a box and destined to waste away there. That you can change and become different things. I liked it. I hadn't heard of this before, but I read Dumplin last year and really enjoyed this. I like the sound of the issues going on in this book, I'll definitely keep my eyes open for a copy! I'm happy to see that you loved this! I adore Dumplin' and I was really excited excited to read it, but for some reason I haven't made it a priority to read it. I need to change that. Great review!